As today’s date has approached, I found myself thinking about this day in 2001. That terrible, awful day. I will never forget it. As long as I live. Living on the west coast as I do, I had risen that morning at 5 to the sound of the clock radio. There had been some inane story on the news that irked me that day, I don’t remember what it was except it was a story of injustice that threatened to wreck my day – so I got ready for work in silence instead of listening to the news. A rarity – being a news junkie, it was not at all normal for me. I had breakfast, got in the car, and left for work, again with no radio on. Uncharacteristic, again. I had arrived at 6am due to deadlines, the only one in my department at that hour, and sat down at my computer to get to work….. I suddenly realized that I was expecting an email response from a friend about lunch, and logged in to my personal email to see if her reply had arrived – and then I saw it. A news ticker email I subscribed to had arrived. I don’t remember exactly what the subject line said, just something about New York City, and explosions. I ran over to the neighboring video department, since I knew they had a television. My friend who worked on the video team was in early, too, and had just turned on the news. He stood staring at the screen in utter shock. I joined him. And we wept in silence. I remember so clearly the heartsick stab in the depth of my chest. I felt physical pain as faces of friends flashed through my mind. Friends from my days in New York City in the early 90s, people who I worked with at One World Trade Center at my first job in the city. The face of a friend who was a firefighter in Queens. Other friends who worked downtown. Friends who I had lost touch with, who I didn’t know how to reach. My coworker and I watched the news in horror. The shock was overwhelming. As the rest of the staff began to arrive – people who had already heard what had happened on their way to work – they joined us in front of the television. After we stood together, unable to grasp what we were seeing, someone had the presence of mind to suggest we pray. We joined hands, cried, and prayed. The most fervent prayers went unspoken, I know. It was hard to utter words in the midst of soul-crushing pain, when it looked as though evil was winning. I had to focus on what I knew was true. God was not going to be knocked off His throne by this or anything else. He is still my refuge. Still my fortress. Still worthy of my trust. The entire company joined together in chapel later in the morning for prayer (it was a Christian nonprofit)…..many of us didn’t last through the day. Parents were anxious to hug children. I went home and hugged my pets, watched the repeated re-runs of the footage for days, imagining the credits would roll at some point and prove this was all a tragic Hollywood film. To this day, those credits haven’t rolled. The “end” hasn’t been seen; we don’t get to go back to days of innocence. Ongoing wars across the Middle East, morphing terrorist organizations, our own citizens inspired by evil to perpetrate evil, and new threats from Asia growing. And yet one thing remains: God is still on His throne. And He always will be. Although the memory of September 11, 2001 reminds us of that day and tries to freshen our fear – let’s resolve to fight fear with faith. Fear will always try to win. Not only are the terrorists working to keep us scared and shake our faith – our own political leaders are even attempting to do the same, whether they know it or not, to scare us into following whatever plans they have. But the only thing we need rely on is what is true, no matter what. 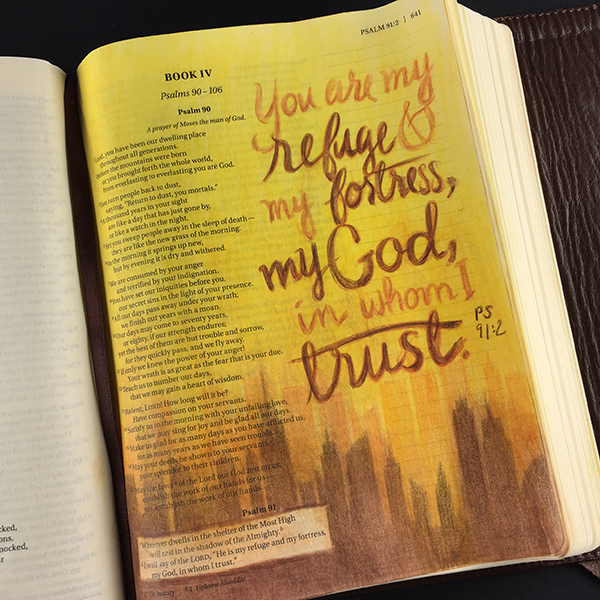 God is our refuge. Our fortress. And He is on His throne today, He will be there tomorrow, and He’s going to stay there forever. No matter what. Never forget. Pray for the families of the victims, and for those first responders who continue to struggle to this day with medical issues and tragic memories of things no one should see. Beautiful and inspired post, Sandy. Left with only one question: were the friends you left behind in New York ok? Yeah, I also focus on the small details in stories, sorry, but I will have that in my mind all day. I was visiting my father on 9/11 and supposed to fly home on the 13th, so I was on one of the first civilian planes allowed in the air after that date and never lost any of my trust in God’s good grace. The worst tragedies are caused by us, not our Lord, who wants only love and all good for us. I hope He can turn the ones who follow Him through Allah to non-violence, as they are violating the Koran with all their actions. Faith will keep us going. Thank you for your post. We are called to be a light in the darkness. We are called to speak hope and faith. We are called to love. I really appreciate your post! Our only hope is in Him, indeed, He is on His throne! Beautiful! We not only lost brothers, sisters, moms, dads and friends, but we also lost courageous dogs who ran in with our fearless firefighters to try to save lives. So much loss it is hard to imagine something so terrible can happen. Thanks for the beautiful reminder that no matter how scary it gets out there, we need to remember that God is in charge and always will be. Bless you, Sandy, and all those families who suffered loss on that day and are still struggling to heal. You said the most important thing – God is still on His throne and He always will be. Thanks, Sandy, for saying exactly what I’ve been feeling! Never forget! God IS on His throne. Wise men still seek Him! Heartfelt post. As we remember 9-11, we know that we can never forget. Nor can we forget the attacks that occurred before or since. We pray for better. This day is surely etched into everyone’s minds and hearts. Thank you for this well written post.We will never forget the day nor the TRUTH that GOD is in control. God bless you Sandy. Amen! I will never forget where I was either. I hope I never do because then I forget the absolute power of His refuge, the examples and sacrifices of those who stepped up, and that safety and comfort does exist in Him arms. Great post, We may never forget! Love your Bible Journaling! Prayers and Hugs all around…we will NEVER forget! Thankful that no matter what the Lord is with me! Thank you! We can never forget! Thank you Sandy for such a beautiful post today. May we never forget. God bless America. I live in New Brunswick, Canada & I remember the whole day like it was yesterday. Thank you for sharing a beautiful tutorial; we can never let our guard down about our freedom. There were *many folks* stranded here, in our city; when I would see an unfamiliar face, I wanted to go & hug that person, telling them it’s ok to cry! Thank you for sharing your story. I guess we all have a story. Never will we forget! Thank You Sandy for your beautiful post…I live in New Jersey and have family members and friends that were in NY at that time who had just walked thru the World Trade Center on their way to work prior to the planes striking the buildings. My daughter who worked for CNN had went up on the roof of their building and watched as the second plane hit. So this tragedy has touched us all. Today I cry as we remember those fallen Heroes and just ordinary people who were heroic that day. We will continue to keep them up in prayer and they will never be forgotten. God Bless You Sandy and God Bless America. Thank you Sandy for sharing this. It was beautifully written and a day I will never forget. I still remember the shock I felt seeing it on the news as it was happening and rushing to my son’s preschool to get him and hug him and let him know how much I loved him. I was so afraid that day, but God is in control and he is still on his throne a day he is stronger and more powerful than any evil out there!!! Thank you for reminding us of that!!! I worked with someone whose brother was severely injured at the Pentagon. She told us the horrible details of her brother’s story, but also recounted numerous acts of heroism which saved many lives. Wow! Beautiful post!!! A big hug from Italy! I live in Nova Scotia, Canada, and I didn’t know anyone either but….the fear, horror, terror and tears were as real as if I knew them all! A painful and horrific day for the world! NO ONE will forget it! Beautifully written post. We must never forget, and we must never take our freedom for granted. I have always led myself to believe that no one on the west coast experienced 9/11 like those of us on the east coast, in the shadow of NYC or Washington DC. I have my own dark story to tell, as I responded to the Pentagon on the 12th & 13th. 12 hour days, responding to flour dust in the bottom of a pizza box…..stories I remember and thankfully many others I have forgotten. Thanks, Sandy for sharing your story and reminding me that all of us had an experience that day, one that we will not forget. God Bless you. Thank you for sharing. AMEN. God bless you and everyone touched by this tragedy.